Polyonics adhesive transfer tapes shown above with ultra-high temperature silicone and double liners. Polyonics new adhesive transfer tapes provide industrial strength bonding solutions for high temperature applications. 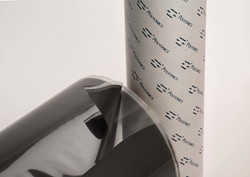 Polyonics new adhesive transfer tapes are designed specifically for high temperature applications. The tapes are available in both high temperature acrylic and ultra-high temperature silicone pressure sensitive adhesives each in a range of thicknesses and temperature ranges. The Polyonics tapes offer manufacturers thin profiles and optional flame retardant and thermal conductive performances. They are supplied with double liners for ease of handling and die cutting, provide high bond strengths, are chemical resistant and ideal for use in harsh environment applications. Polyonics manufactures innovative, high performance coated film, tape, label and tag materials that withstand high temperatures and harsh environments while protecting products from ESD, heat and/or fire. The materials are used by converters and OEMs worldwide.